From the beginning, one of the paradoxes of the massacre at Srebrenica was that it took place in a declared United Nations "safe haven" -- the first in history -- under the official supervision of Dutch peacekeeping troops. After speaking to survivors in Tuzla and learning of stories from the Dutch press, Rohde was convinced that there was a larger, more controversial story to be told about the Srebrenica massacres. He traveled first to Zagreb, Croatia, and spoke with diplomats, intelligence sources, war crimes investigators and aid workers to corroborate survivor accounts. A picture of scandal involving Dutch peacekeepers began to take form. Rohde then went to the Netherlands to investigate why Dutch peacekeepers and UN officials failed to protect the "safe area," thus leading to the execution of thousands of Muslims at Srebrenica. In the spring of 1993, a Serb assault nearly took Srebrenica, prompting the UN Security Council to declare it and five other villages to be "safe areas." Refugees fleeing war-torn Bosnia had sent Srebrenica's pre-war population skyrocketing from 9,000 to 42,000. Eventually, 3,500 lightly-armed UN troops were assigned to protect them. On July 3, 1995, the Serbs again launched an offensive against Srebrenica. UN officials believed the Serbs sought control of a strategic road and a bauxite mine. That theory was obliterated when two Serb shells slammed into the wall of Foxtrot, one of several Dutch observation posts, three days later. 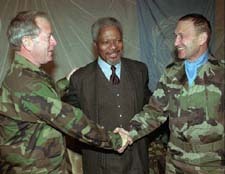 Dutch Commander Lieutenant Colonel Ton Karremans requested Lieutenant General Bernard Janvier to provider assistance with NATO air strikes on Bosnian Serb targets. Janvier denied the request. On July 8, three more Serb rounds hit Foxtrot. Muslim soldiers opened fire on the Serbs. Fifteen minutes later, a Bosnian Serb tank drove over a Muslim trench and pulled up in front of Foxtrot. Serb soldiers ordered the Dutch to leave. As the Dutch fled, enraged Muslims killed one of the departing peacekeepers, Ravi van Renssen, as punishment for leaving them defenseless. The remaining Dutch posts surrendered the next day. Air strikes finally were ordered for July 11 to prevent an assault on Srebrenica, but fog made them impossible. 25,000 to 30,000 Muslims huddled around the UN base at Potocari. Led by General Ratko Mladic, Bosnian Serbs began executing Muslim men. Over two days, Dutch peacekeepers would witness one execution, videotape the bodies of nine dead Muslims, and do little to prevent Serbs from taking 800 elderly Muslim civilians from their families, presumably for executions. No one at the Dutch Ministry of Defense would talk, so Rohde tracked down two of the peacekeepers who had left the army and had already given their accounts to the Dutch press. Rohde returned to Zagreb. He interviewed high-ranking UN war crimes investigators, military officials, and diplomats, which, combined with earlier accounts from survivors and Serb soldiers, established that President Milosovic knew of the massacre and may well have authorized it. With competition for the story heating up, Rohde knew he needed more time. He filed an inconclusive story on intentional Serbian pollution of Muslim drinking water that served to distract other reporters. While Rohde investigated "his" story, other newspapers were covering related stories which Rohde was not able to report. Fortunately, the Monitor had a stringer in the region who could cover breaking news and ensure that the paper fulfilled its policy of covering all sides of the Bosnian war.